The day before yesterday my good friend and her husband were car jacked. Their life-blood, a delivery van was taken by force and they were left with their lives, and a large hole in their business. Because the insurance would not replace the van without a deductible, they were uncertain of the future. Our other friend called us yesterday and told us of a threat someone made on his life (and the lives of his family). After praying, he and Mario pro-actively handled the situation and made it come right.... My best friend failed her driving test, which would have been a key to her becoming more markatable. The young mother we've been trying to help become a responsible adult has been accused of stealing. The cries of hungry and sick friends are filling our ears. And by the way, the World Cup is beginning tomorrow - in Johannesburg. Reality is that our nation is plagued with ills that is unfamiliar to most people in the world, especially the first world. And we do seem to be a carefree nation enjoying the hype and the noise and the dancing that's associated with the party that is the World Cup of International Football (soccer). We do appear in news stories and commercials to be a beautiful people in a sun-drenched land that has beautiful, barefooted children with not a care in the world, unhurried and undisturbed... by anything. In a way, it's true. South Africa, with its dichotomies of rich and poor, sick and well, blessed and cursed, encouraged and discouraged is a very different country than the one we came from. Still, we have learned to bear down against adversity and stiffen ourselves against the wind. The survivor in us has been birthed and is a dwarfed version of the natives here. For instance, a game as silly as soccer (remember I am not a sports nut) has encouraged young kids to "know your status" (HIV/AIDS) when most celebrities or church groups have been unsuccessful. Today's cover story of the New York Times is about the soccer clubs springing up around rural South Africa encouraging not only excellence in the sport, but honesty in health and well-being. Many kids have volunteered to be tested for the virus (please read my post from May if you haven't already, entitled "virus"). To see how such a huge thing such as HIV/AIDS awareness being promoted in RURAL VILLAGES here is astounding. I have seen the most gifted doctors and speakers deliver heart-felt pleas for people to get tested, for free, but with the stigma attached to the virus, they are almost wasting their breath. Now for clubs that tout football and fitness to say "Hey, you should get tested over there at that table" and the kids go there...it's a miracle. Reality is funny. 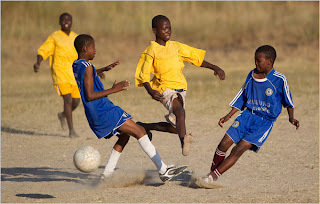 Soccer influences a nation like this one to be responsible. It influences a world to come together. It makes my heart beat faster (we are less than 24 hours away from kick-off).... what can I do, other than rejoice in it? By the way...my friend just called and said they can get a new delivery van, thanks to their insurance. Our other friend has been successful in squelching a life-threat, and ministered the Gospel to the man who threatened him...and my friend who failed her driving test is happy about our party tomorrow, and also happy that she can test again soon. I'm prepared to make restitution for the young mother... aaahhh, life!! Thank you, God, for loving us!! !